Topological effects, such as those found in crystals whose surfaces conduct electricity while their bulk does not, have been an exciting topic of physics research in recent years and were the subject of the 2016 Nobel Prize in physics. Now, a team of researchers at MIT and elsewhere has found novel topological phenomena in a different class of systems—open systems, where energy or material can enter or be emitted, as opposed to closed systems with no such exchange with the outside. The results are being reported this week in the journal Science, in a paper by recent MIT graduate Hengyun "Harry" Zhou, MIT visiting scholar Chao Peng (a professor at Peking University), MIT graduate student Yoseob Yoon, recent MIT graduates Bo Zhen and Chia Wei Hsu, MIT Professor Marin Soljačić, the Francis Wright Davis Professor of Physics John Joannopoulos, the Haslam and Dewey Professor of Chemistry Keith Nelson, and the Lawrence C. and Sarah W. Biedenharn Career Development Assistant Professor Liang Fu. In most research in the field of topological physical effects, Soljačić says, so-called "open" systems—in physics terms, these are known as non-Hermitian systems—were not studied much in experimental work. The complexities involved in measuring or analyzing phenomena in which energy or matter can be added or lost through radiation generally make these systems more difficult to study and analyze in a controlled fashion. But in this work, the team used a method that made these open systems accessible, and "we found interesting topological properties in these non-Hermitian systems," Zhou says. In particular, they found two specific kinds of effects that are distinctive topological signatures of non-Hermitian systems. One of these is a kind of band feature they refer to as a bulk Fermi arc, and the other is an unusual kind of changing polarization, or orientation of light waves, emitted by the photonic crystal used for the study. Fermi arcs, one of the unique phenomena the team found, defy the common intuition that energy contours are necessarily closed curves. They have been observed before in closed systems, but in those systems they always form on the two-dimensional surfaces of a three-dimensional system. In the new work, for the first time, the researchers found a Fermi arc that resides in the bulk of a system. 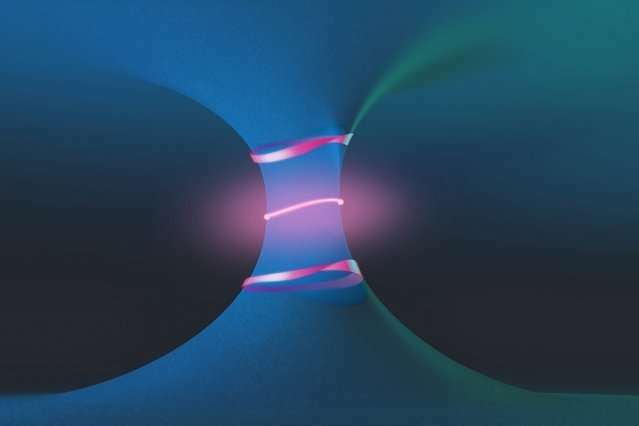 This bulk Fermi arc connects two points in the emission directions, which are known as exceptional points—another characteristic of open topological systems. The other phenomenon they observed consists of a field of light in which the polarization changes according to the emission direction, gradually forming a half-twist as one follows the direction along a loop and returns back to the starting point. "As you go around this crystal, the polarization of the light actually flips," Zhou says. The new work is "mostly of scientific interest, rather than technological," Soljačić says. Zhen adds that "now we have this very interesting technique to probe the properties of non-Hermitian systems." But there is also a possibility that the work may ultimately lead to new devices, including new kinds of lasers or light-emitting devices, they say. "We had a hunch" that such half-twist behavior was possible and could be "quite interesting," Soljačić says, but actually finding it required "quite a bit of searching to figure out, how do we make it happen?" "Perhaps the most ingenious aspect of this work is that the authors use the fact that their system must necessarily lose photons, which is usually an obstacle and annoyance, to access new topological physics," says Mikael Rechtsman, an assistant professor of physics at Pennsylvania State University who was not involved in this work. "Without the loss … this would have required highly complex 3-D fabrication methods that likely would not have been possible." In other words, he says, the technique they developed "gave them access to 2-D physics that would have been conventionally thought impossible."